Looking for some new quality kicks but perhaps something a bit different from the rest? Well look no further than the ‘Made in USA’ collection from PF Flyers. The brand date back to 1933, when creator Hyman L. Whitman filed a patent design for, ‘Posture Foundation’. His design offers foot arch support which helps to reduce leg strain by evenly distributing the weight of the wearer. A similar idea to New Balance’s theory of the ‘chicken foot’ idea, leading to the development of NB’s infamous ‘encap’ technology in footwear to help with ‘serious’ running. The ‘Posture Foundation’ sole was first used in BF Goodrich shoes and quickly boomed due to the comfort, durability and clean look. In 1944, BF Goodrich released a line of shoes known as ‘PF Flyers’. Since then, PF Flyers has grown massively across the globe with it’s iconic look, in-keeping with the American Heritage it is renowned for. To celebrate the history and legacy of the brand, PF Flyers has released a two-minute video featuring many small, Boston-based businesses known for their high-quality handcrafted goods. These include Bully Boy Distillers, Repeat Press, Forestbound Bag Co., Redemption Tattoo and Bobby From Boston. These businesses produce in small batches because of their ethos, which is, ’quality before quantity’. They refuse the idea of mass-production and want instead to guarantee a long lasting product for it’s consumers. PF Flyers, much like these brands, has now brought the production of the Centre Hi show back to it’s rightful home. Taking on the Boston business ethos, the ‘Made in USA’ Centre Hi by PF Flyers, are all individually hand crafted. Produced with American sourced materials, much like the original PF Flyers of the day, the shoe merges retro athletic style and comfort to give a contemporary vintage running shoe. Made from 14 oz. heavyweight canvas, a lux leather toe cap and finished with pig skin lining. Inspired by the 1960’s style branding, with hand drawn midsole stripes, hand-stamped tongue branding and ankle patch. With all of these high qualities the shoe is centralised by the premium performance insert that rests above a DESMA injected PU midsole! All combined, these features provide the comfort, style and durability that has led to ‘PF Flyers’ worldwide notoriety. 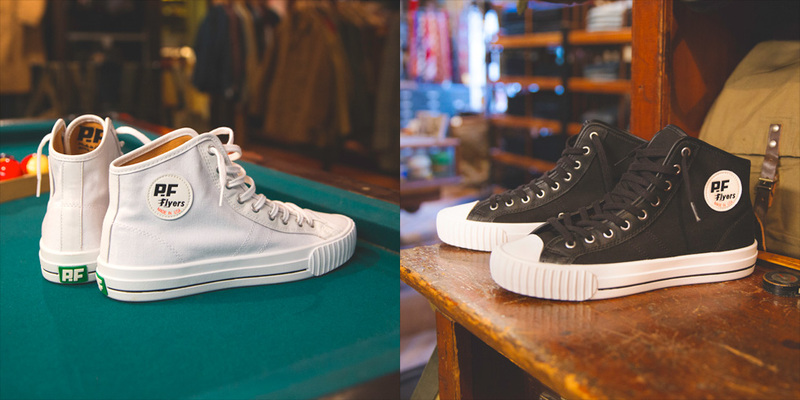 The PF Flyers Centre Hi provide something many shoes can’t do nowadays – style and comfort all in one.